I finally got around to downloading photos from the mini vacation we just enjoyed at my sister’s beach house. There were about 400 shots, each one screaming summer louder than the next, and I’m somewhat alarmed to report that only about 20 of them contained the presence of an actual human. Though I’m unable to prove it in pixels, I swear we did normal things that normal vacationing families do: We bodysurfed in the Atlantic, worked out the kinks in our backhands (some of us, at least…mine is forever ruined), did the whole Breakfast at Wimbledon thing, never bothered to change out of our bathing suits, engulfed crime novels and graphic novels, went on bike rides and runs along redwing-blackbird studded beach roads. But from the look of this download, you’d think it was all dinner all the time: corn and tomatoes, summer fruit galettes, soft-shelled crabs, Dark & Stormies, grilled fish tacos, bright slaws, and the beautiful minty pecorino’d fava beans you are looking at above, which are in season for approximately six more minutes, so use them immediately. I’m already depressed about how fast summer is going — so anyway, who has time to take pictures? Remove fava beans from pods. (I used about four handfuls of pods.) Boil beans in water for about 3 to 4 minutes, then immediately plunge in ice bath. Remove each bean from its casing (this is a big pain, be forewarned) and add to a medium bowl. Add a tablespoon olive oil, frehsly grated Pecorino a small squeeze of lemon, 1 sprig of mint (chopped) salt and pepper. Mix and mash with a fork until it reaches desired consistency. Serve with baguette slices. 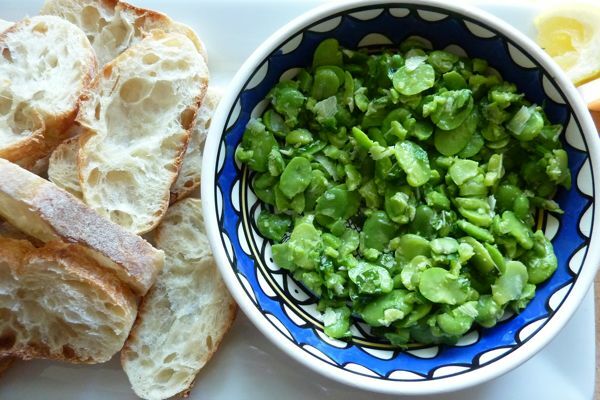 I just saw fava beans in the market today and wondered what I could do with them… this looks great! Also, you guys should know, Kyle’s new mantra is Daddy Needs A Drink … and we are packing ginger beer from Bermuda (and stuff to mix with it) as we head off to Yosemite this week 🙂 Happy summer!!! This is too easy! I love the flavors you combine here. Too bad fava beans are out of season here. Will have to save this for next year… or substitute with canned? i’m in utter despair that it’s *mid-july* already. where has it gone? Wise choice bet you had fun….